Bart D. Ehrman is James A. Gray Distinguished Professor of Religious Studies at the University of North Carolina at Chapel Hill. He has written or edited more than twenty-nine books, including five New York Times best sellers. His publications include After the New Testament, Second Edition (OUP, 2014), The Bible (OUP, 2013), Forgery and Counterforgery(OUP, 2013), and The Orthodox Corruption of Scripture, Second Edition (OUP, 2011). Each chapter ends with a "Take a Stand" section. INTRODUCTION: WHY STUDY THE NEW TESTAMENT? 2. 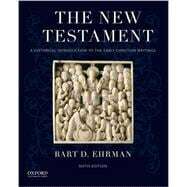 DO WE HAVE THE ORIGINAL NEW TESTAMENT? How Can We Know if We Have an Ancient Author's Actual Words?